Siobhan-Marie O'Connor set a new British record to win silver in the 200m individual medley at the World Short Course Championships in Doha. O'Connor touched in two minutes, 05.87 seconds to win her third silver behind Hungary's Katinka Hosszu, who lowered the world record to 2:01.86. The British 50m breaststroke record was beaten by Adam Peaty, who leads the semi-final qualifiers in 25.25 seconds. Georgia Davies also set a new British 50m backstroke best at 26.36 seconds. 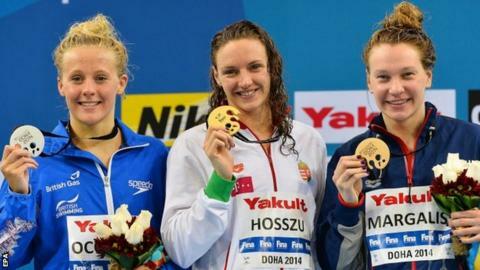 Davies took 0.07 seconds off the record set by her housemate Fran Halsall to qualify fifth fastest for Sunday's final. France's Florent Manaudou won the 50m backstroke in a world record 22.22 seconds while Britain's Chris Walker-Hebborn was seventh in a new personal best. Russia's men lowered their 4x50m freestyle relay record to 1:22.60 and the United States did likewise to win the mixed 4x50m freestyle relay in 1:28.57. South African Chad Le Clos won the 50m butterfly to claim his third title of the championships and Alia Atkinson won Jamaica's first gold at the world championships in the women's 100m breaststroke. Great Britain have won seven medals during the five-day meet, which finishes on Sunday.